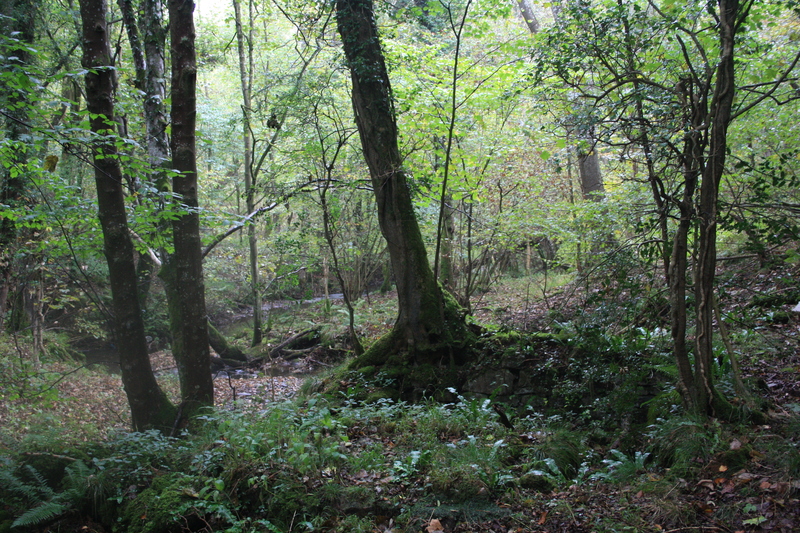 Ffynnon Wen lies in woods about half a mile to the north west of Henllan on the banks of Afon y Meirchion. It is a large complex, but easy to miss at first, being totally overgrown and merged into the landscape. 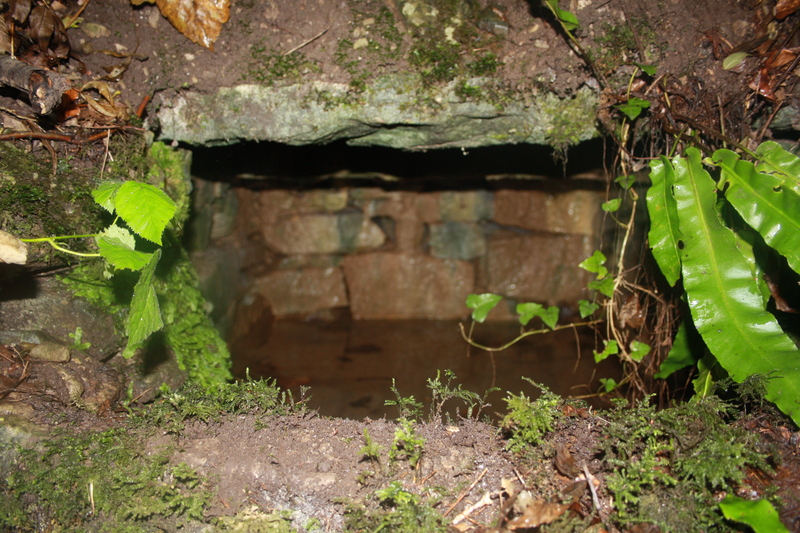 The well itself is built into the back about ten yards above the well. 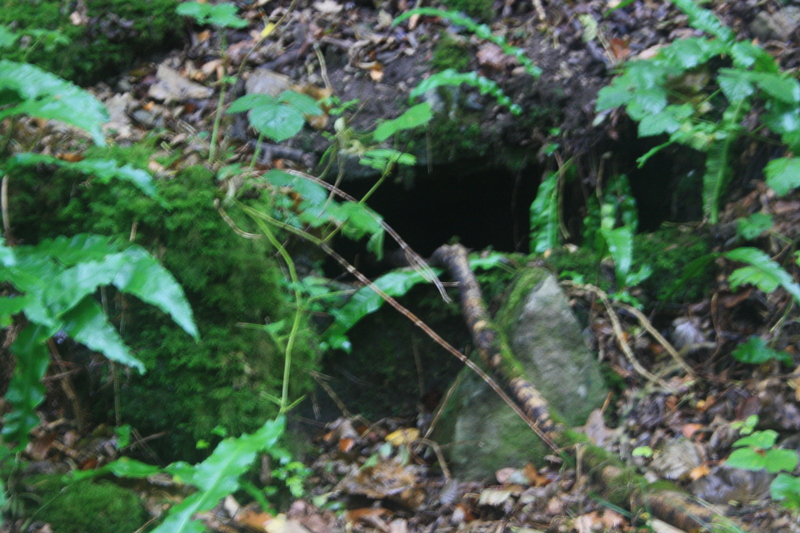 There is a small entrance into the chamber, fronted by a rectangular stone. The well inside is stone lined, about two to three feet square, with a depth of water of about two feet inside on the day we visited. The bath measures about 12 feet square. There was water in it to a depth of a few inches, water drains from the bath into the adjacent river. The dressing room is least well preserved, a few courses of stone, overgrown by weed remain to indicate where it was beside the bath house. That the site has at sometime had some importance is maybe evidenced by the remains of a road that must once have led past it, with the remnants of a stone wall running alongside it for sections of the route. 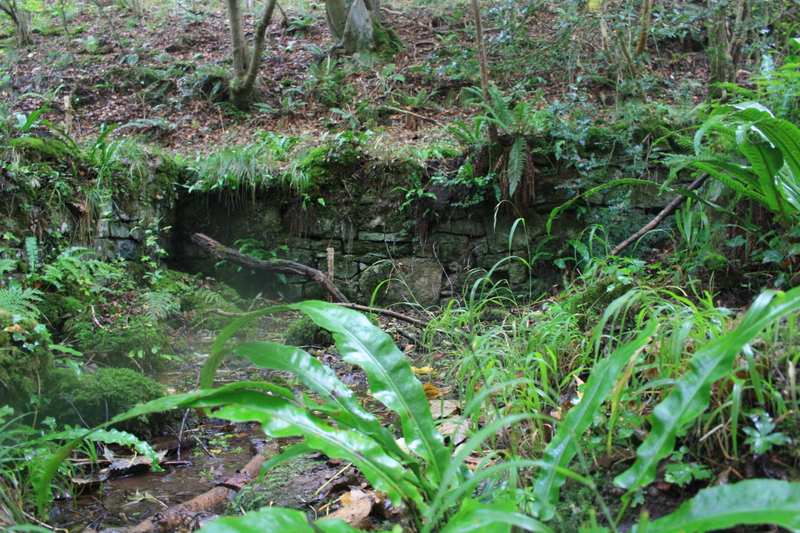 Whether this was purely a riverside bathhouse belonging to the nearby estate – some medieval lord’s private jacuzzi, or a site of more significance remains to be seen. 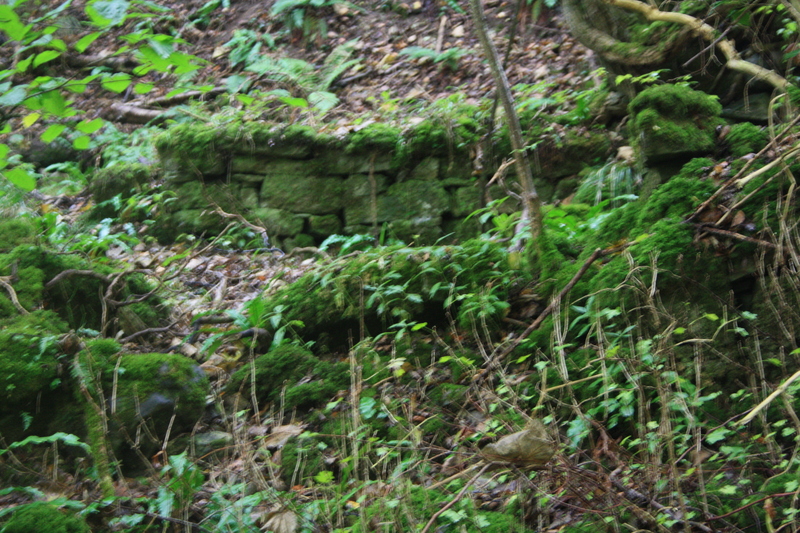 Ffynnon Wen translates literally as “White Well”, however, in the 1912 Inventory of Ancient Monuments in Wales the Royal Commission’s writer, when discussing another Ffynnon Wen at Gwaunysgor in Flintshire, makes the argument that the name signifies “Holy Well” with gwyn being mutated according to rules of Welsh grammar following ffynnon into wen = blessed. 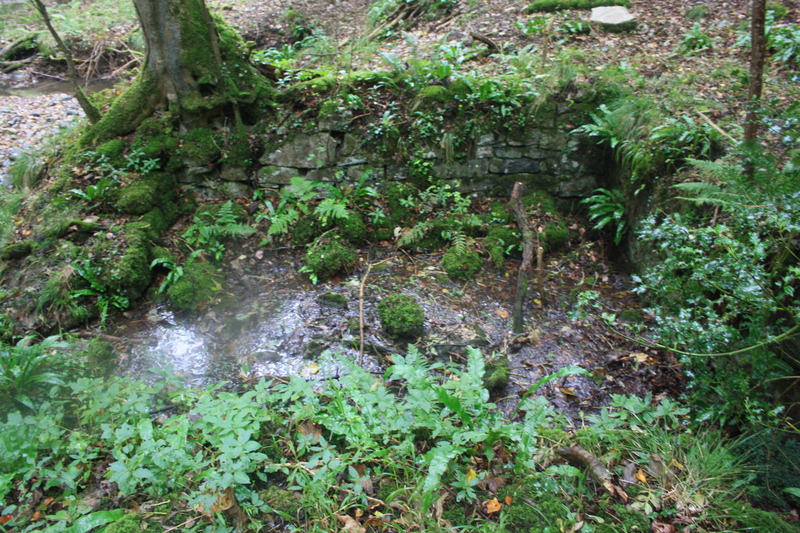 The holy well of Henllan was much closer to the church, and no longer exists. When visiting the church the current vicar showed us a medieval font that he suggested had been lifted out of the base of that well at some time in the recent past. Regarding Ffynnon Wen, Henllan. The Lives of St Gwenfrewi (Winefride) state that she led her merry band of holy virgins by some unknown route from Hollywell, via her uncle’s pad at Tremeirchion (notice “MERCHION”), then to the llan at nearby Bodfari, then up to visit Saint Sadwrn at Henllan, and then, somehow, over the moors to her other uncle at distant Gwytherin. How did she get from the Vale of Clwyd all the way to incredibly remote Gwytherin? Well, a look at a map shows that the tiny village is actually almost at the spring of the river Elwy. The easiest way to find the place, therefore would be to follow the river upstream from Llan Elwy/St Asaph. If she did this, she could have visited St Sadwrn easily enough by simply following the tributary of the Elwy up to near its spring at Henllan. Notice the name MEIRCHION again. TREmeirchion – the town of meirchion – and AFON meirchion. (Am I completely crazy to speculate that “meirchion” might originate in a non-Welsh-speaking early cartographer mis-hearing an medieval Welsh word for “maiden” or “virgin”?) The hillside between Onnen Asaph and Bodfari, so closely associated with the earlier of the two Beunos, was at one time known as” Lleweni” – possibly “the place of Gweni”. Gweni, according to the Lives was Gwenfrewi’s mother; the epithet “gwen”/”wen” was possibly attached to the family – appearing in the names of both mother and daughter; maybe the women of the family were remarkably pale or blonde. The name Ffynnon Wen. then, might well be a reference to the presence of Gwenfrewi at Henllan – or at least to a local legend of the same. In case you’re wondering, I’m currently a quarter of the way thru writing a rather ambitious epic poem about our local 6th C saints – which is why I’ve come to spend so long thinking about all this stuff. Thanks for the great site. I must admit I don’t know nearly enough about Winefride yet, obviously I have visited her well at Holywell several times, but haven’t got around to writing anything constructive about it. I have read the stories you relate, but must find time to consider them in more detail. Your theories are fascinating, and I look forward to seeing the epic when it emerges. Many thanks for this contribution. Isn’t Holywell a disappointment? It was to me anyway. I simply can’t believe Winefride’s miracle originated there: if I had to bet I’d put my money on Tremeirchion, or even Castle HIll in Denbigh (you simply MUST visit Goblin Hole, in the shadow of the castle walls – by far the spookiest place I’ve ever been). At the risk of boring you half to death, and anyone else who tries reading the following, I’d like to amend the vague idea sketched in my earlier comment. Sorry to harp on about this, but the more I think about the subject the more interesting it becomes. I began by assuming “wen” was an epithet belonging to various families (which isn’t a far-fetched idea) which had become attached to places associated with those families. This might explain why “wen” appears so frequently : the use of adjectives as prefixes or suffixes is not very common with old Welsh place-names, I believe I’m right in saying – we find occasional “bach”s and “hen”s and, at a stretch, “hafod”s; whereas “wen”s abound, comparitively. But, then, I got to thinking about the old, 6th C, monastic site/church on the outskirts of Denbigh – known today as “Whitchurch”, but which stands next to a farm which still bears the old name “fferm eglwys wen”; the area of the town adjacent is still called “trewen” (now-a-days a non-descript housing estate). I wondered why the name of the saint, the virgin Marchell, came to be lost – why is it “Eglwys Wen”, not “Llanmarchell”? And, then, that made me think of Saint Kentigern, and about how he is often known as Saint Mungo – meaning “much beloved”, or something along those lines (my memory fails me). It isn’t unheard of for a saint to be known by their epithet, rather than their given name: Saint Pantaleon (“most compassionate”); Saint Peter (“the rock”, of course); probably Saint Beuno himself (“the good” – identical to the “bonne homme”s of a later epoch: Beuno’s faith came to Wales via Gaul did it not). And then I started thinking about what the adjective “wen” might mean when applied to water – as in Ffynnon Wen or Afonwen. Would “wen” mean “white”, or “pale”? Not likely. Much more likely “wen” would mean “clear”, or “clean”, or, in fact, “pure”. That’s not implausible is it? I think “wen” might easily have had the connotation “untainted”, or “pure”. If so, can we understand how it might have been that the land next to Marcell’s llan in Denbigh came to be called “Trewen”? why her church became Eglwys Wen, not Llanmarchell? Can we safely imagine that some few of the many “wen” place-names which abound in Wales might, in fact, preserve the memory of a “holy virgin” who once was associated with those places? So: in the same way that a spring of Beuno came to be named simply Ffynnon Beuno, a spring associated with a famous “holy virgin” would be called Ffynnon Wen. Does this make sense? If I’m right in this, and the epithet “Wen” meant, some of the time at least, “pure”/”virgin”, then this casts the name “Gwenfrewi” in a new light: “Gwen” would mean “Virgin”, and “Frewi” (according to the internet) means “peaceful”, or maybe “meek”. So, wouldn’t that make the name “Gwenfrewi”, essentially, “Holy Virgin”? Disappointment ? I suppose the setting is disappointing, it’s a very much exit through the gift shop oriented site, very different to almost every other well. It is very much lacking in the atmosphere that wells such as Ffynnon Sara or Cefn Meiriadog have. However I do very much like the building that houses the well which is still so complete, and the fact that it is still so well used. I visited another Ffynnon Wen, at Trelawnyd last weekend. Again the common translation is “white”, but clearly you have thought through these alternative name in some detail within your research. I am not in the position right now to offer much more than a cursory answer. When setting up the blog I had hoped that it would inspire (and present a location for) debate, and I am pleased that you are contributing. I am certainly considering the issues you raise, and shall reply more thoroughly in due time, and I really hope any one else who lands here will do the same.